This is part of our series on porter. The series starts with an article on water treatment. Once you’ve got your recipe assembled, you can brew your porter as you would any ale. However, you have a couple options related to handling the dark grains. Roasted grain kernels lose some of their dry weight during kilning and are hence slimmer than pale malt kernels. If you mix them in with your pale malts and mill them, they will likely not be as finely crushed as the lighter malts. As such, some brewers mill the dark malts separately. In addition, some brewers crush their dark grains more finely — in some cases into flour — especially if they use one of the mashing variants described below. Some brewers handle their dark grains differently when brewing a porter. Because dark grains can contribute a bitterness to the beer and also release their tannins more easily than more lightly kilned grains, some brewers seek to lower the amount of time they are mashed. Instead of mixing the grains and mashing as usual, they withhold the dark grains from the mash initially. Then, near the end of the mash, they stir the dark grains into the top of the grain bed before proceeding with recirculation and sparging. Other brewers steep the dark grains separately, then add the dark grain extract either late in the boil or even in the fermenter (recall that the darkest grains are sterile when they leave the maltster.). Some brewers steep the grains hot and for a short amount of time — Gordon Strong, in his book “Brewing Better Beer” (2011, Brewers Association) advocates steeping at 165 °F (74 °C) for 5 minutes at a ratio of 2 qts. of water for each pound of grain (4.2 L/kg). If you’re going to steep for a short amount of time, crushing finely will increase the amount of color, flavor and aroma you get from the roasted grains, but also increase the amount of husk material (including tannins) that gets extracted. Alternately, the roasted grains can be steeped in cold water overnight (at the same ratio of water to grain). When adding the grains late in the mash, late in the boil or in the fermenter, no instructions are given on how to adjust the brewing liquor. When I have used the “late in the mash” variant, I have withheld the calcium carbonate I was going to add to counteract the acidity of the dark grains until I stirred in the dark grains. In other words, I adjusted my water chemistry for an amber ale, mashed the base grains and crystal malts, then stirred in the roasted grains along with the calcium carbonate. I tend to think that ingredient choice (black malt vs. debittered black malt), controlling your mash pH through your water chemistry and (especially) not oversparging is the easiest way to control astringency. If you use continuous sparging, you can taste the final runnings as they come off and quit sparging when they taste exceedingly astringent. The alternate methods may be worth exploring if you want to absolutely minimize dark grain bitterness and astringency, or have had problems with this in the past. For whatever it’s worth, I think the bitterness and slight astringency you get in a well-made porter give the dark grain character a “bite.” I like this and don’t attempt to do away with it completely, especially in a porter that veers into robust porter territory. If you’ve experienced problems with overly bitter or astringent dark beers, using one of the alternate methods of handling the roast malts may help. If you haven’t had this problem, or are brewing your first porter, simply stirring all your malts and grains together in the mash has worked for brewers for centuries. 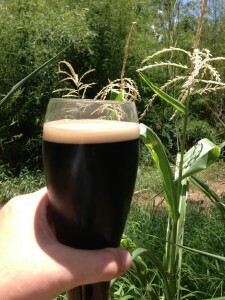 This series will continue with a discussion of specialty porters. Nice article, Chris. I haven’t tried the separate cold or hot steeping methods yet, but I have used the late mash addition of dark grains with great success. It really helps reduce the bitterness of dark grains, which is something I really enjoy in my porters. Thanks! It’s amazing how two beers brewed from the same recipe could taste very different based solely on how you handle the dark grains.